I work at The University of Manchester in the UK and, as some of you may have heard, two of our Professors recently won the Nobel Prize in physics for their discovery of graphene. 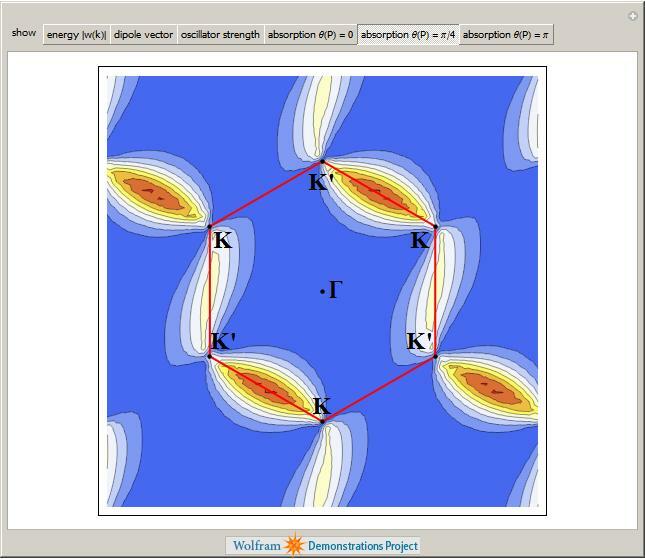 Naturally, I wanted to learn more about graphene and, as a fan of Mathematica, I turned to the Wolfram Demonstrations Project to see what I could see. 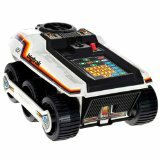 Click on the images to go to the relevant demonstration. Back when I used to do physics research myself, I was interested in band structure and it turns out that there is a great demonstration from Vladimir Gavryushin that will help you learn all about the band structure of graphene using the tight binding approximation. The electronic band structure of a material is important because it helps us to understand (and maybe even engineer) its electronic and optical properties and if you want to know more about its optical properties then the next demonstration from Jessica Alfonsi is for you. Finally, Graphene can be rolled up to make Carbon Nanotubes as demonstrated by Sándor Kabai. 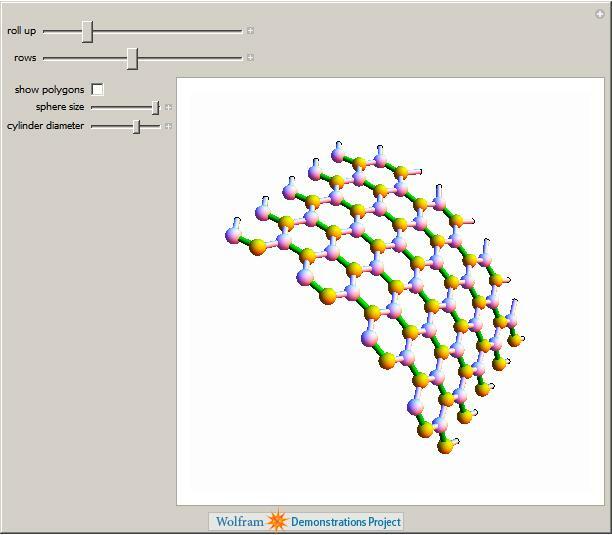 This is just a taster of the Graphene related demonstrations available at The Wolfram Demonstrations project (There are 11 at the time of writing) and I have no doubt that there will be more in the future. 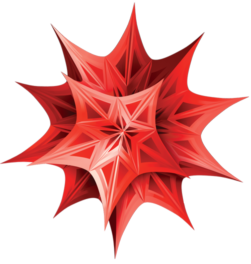 Many of them are exceptionally well written and they include lists of references, full source code and, best of all, they can be run for free using the Mathematica Player. 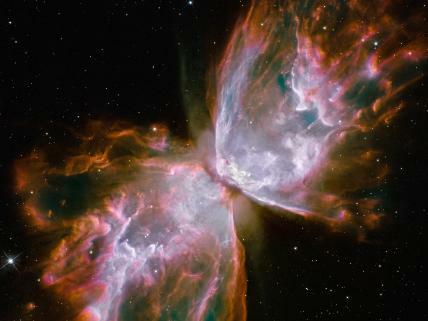 Don’t just read about cutting-edge research, get in there and interact with it! There are two kinds of geniuses: the ‘ordinary’ and the ‘magicians’. An ordinary genius is a fellow whom you and I would be just as good as, if we were only many times better. There is no mystery as to how his mind works. Once we understand what they’ve done, we feel certain that we, too, could have done it. It is different with the magicians. Even after we understand what they have done it is completely dark. Richard Feynman is a magician of the highest calibre. I never met Feynman of course as he died of cancer back in 1988 when I was only 10 but I have read masses about him. I first learned about him from my high school physics teacher who lent me a book called Surely You’re Joking Mr Feynman which contained hardly any physics but a lot of stories about a man who was intensely interested in the world about him. I’ve bought that book several times now because I keep lending it to people who go on to lend it to people! Not only was Feynman a Nobel prize winner but he was also a first class physics teacher and over 40 years ago he delivered a set of introductory lectures at Caltech which are widely considered to be among the best ever written. These were later converted to a set of books that have been continuously in print ever since and tend to be on the bookshelves of many people interested in physics. In 1964 Feynman delivered a different set of lectures called The Character of Physical Law at Cornell University. This set of lectures was recorded by the BBC and it turns out that Bill Gates recently bought the rights to them. In a wonderful display of philanthropy Mr Gates has made these lectures freely available to the world on Microsoft’s Project Tuva site. Sadly, however, the lectures have been delivered via Microsoft’s proprietary Silverlight system. This is just fine if you are a user of Windows or Mac OS X but Microsoft hasn’t released Silverlight for Linux operating systems. The practical upshot of this is that if you run Linux on your computer then you can’t watch the lectures. There is a community effort which is producing a free version of Silverlight (called Moonlight) but sadly Project Tuva doesn’t work on systems running Moonlight (at the time of writing at least). “Do you like pendulums?” I was asked, “because if you don’t like pendulums then I wouldn’t bother with A-Level physics if I were you.” This was the advice given to me by an outgoing sixth-former at a school open day around 14 years ago. He had obviously had an unhappy time during his physics studies and was doing his best to turn me away from the subject but he hadn’t counted on the fact that I actually do like pendulums. 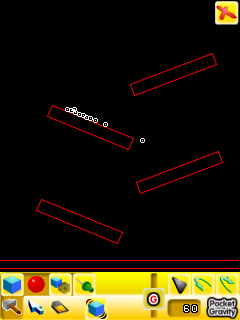 Besides, I figured that high-school physics isn’t only about pendulums – they’ve got springs too! Of course everyone knows what a pendulum is – thing that swings back and forth, used in grandfather clocks. When all is said and done, you might argue that pendulums are simple, sometimes useful and, above all, dull. My sixth-form friend certainly thought so but maybe that was because he didn’t have enough pendulums! One pendulum is useful but two are much more interesting and four can be downright fun! The Victorians certainly thought so and over 100 years ago they used to build home entertainment devices out of pendulums called harmonographs. You have probably never heard of a harmonograph (I certainly hadn’t until a couple of days ago) and so maybe a bit of detailed explanation is in order. Imagine that you have attached a pencil to a pendulum so that it brushes across a piece of paper as the pendulum swings back and forth. When the pendulum finishes swinging you will end up with a single straight line drawn on your paper – very dull indeed! Now imagine further that you somehow manage to connect a second pendulum to your pencil which oscillates at right angles to the first. The resulting drawing might look something like the image below. If your imagination fails you (or if my explanation isn’t up to the job) then you can see a video of the set up I am trying to describe by clicking here. Alternatively, you could have one pendulum attached to the pencil and another attached to the drawing surface as in the example below. 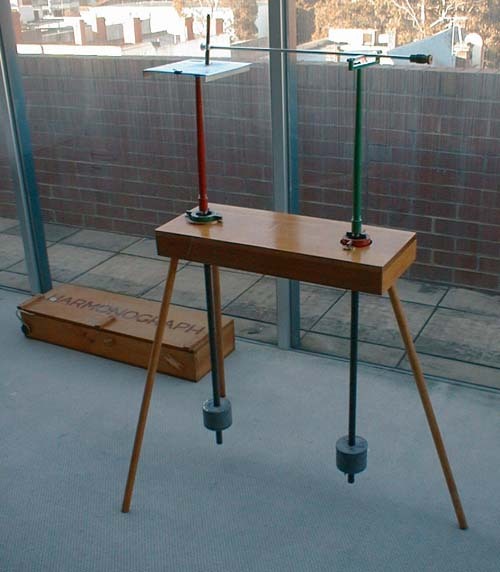 There are many different designs for harmonographs and some manage to incorporate up to 4 different independent oscillations by attaching pendulums to the drawing surface as well as the pencil itself. The resulting drawings can be spectacular. where t denotes time, p is a phase factor between 0 and 2*pi and d is the strength of the damping term. The larger you make d, the more quickly the pendulum oscillations will decay. Now, if you search the internet you will find that other people have written down equations for harmonograph plots and you might find that they look slightly different to the ones I have written above but you should always be available to transform my equations into any other valid set. For example, the equations given in the website here describe a system with only three pendulums so simply cross out the second term for y(t) in my set of equations and you are almost done. You might also find that some people use Cosine instead of Sine – in which case you simply set the phase in my equations to be pi/2 since sin(x+pi/2) = cos(x). 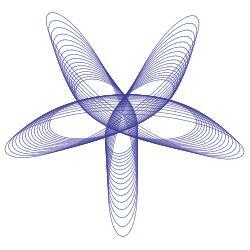 Something else I have done is to assume that the initial amplitude of all of my pendulums is set to one. This is because I already have 12 parameters to play with which I think is more than enough for an initial play around. As an aside, it turns out that these equations can describe much more than just Harmonographs. For example, by setting the damping factors to 0 and by crossing out the second term in each equation (thus only considering 2 oscillators) you will end up with Lissajous figures. 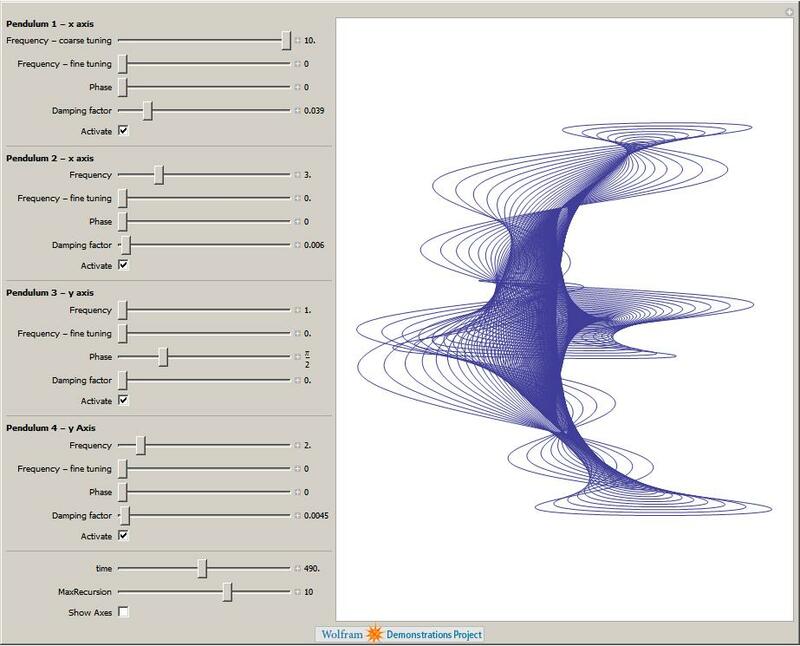 With a bit of algebraic manipulation you can also obtain the equations that describe spirograph curves – see this link for the details. 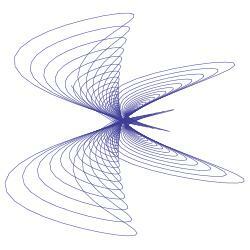 So, we have a set of parametric equations and we want to plot the result. In Mathematica the ParametricPlot command is what we need so let’s give our 12 parameters some numbers and see what we can come up with. I quite like this version as you can see all of the parameters at once but it turned out to be too big for inclusion in the Wolfram Demonstrations Project. I tried various tricks to try and shoe-horn all of those parameters into a smaller applet and was about to give up when an employee at Wolfram sent me some code that sorted out the size problem by introducing a set of tabs. I like his solution so much that I’ll probably be writing about it soon in a separate article. 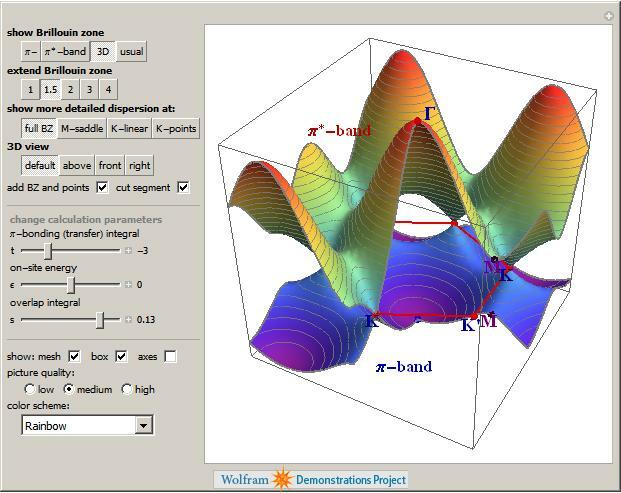 The resulting Wolfram Demonstration was published today – click on the image below if you’d like to take a look. Animate the plot so that it looks more like the real thing. Add the ability to modify the starting amplitude of each pendulum. Of course the source code is available so if you have a burning desire to do any of these yourself then feel free – but please let me know if you do. I hope that you enjoy the results of these applets and would love to see any particularly interesting images that you might come up with – sending the equation parameters would be useful as well. Hopefully, this article has whetted your appetite for harmonographs – if so then you might find the following resources interesting. More instructions for making harmonographs from 1920-30.com. Analysis of a home built harmonograph – a great model, I’m not sure about his equations though. 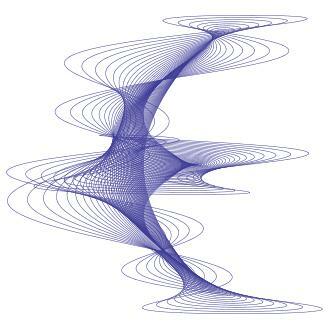 Harmonograph – A visual guide to the Mathematics of Music . A book by Anthony Ashton. The Meccano Super Models (Volume 2) by Geoff Wright. ISBN 0-904568-07-5 contains instructions for making a Harmonograph out of Meccano. I can’t get hold of a copy unfortunately. The following two journal articles contains some interesting historical and technical information concerning harmonographs. Harmonograph simulator written in tcl. A few years ago, while working through a degree in theoretical physics at Sheffield University, I took a course on special functions in physics that was given by the legendary lecturer Dr Stoddart (saviour of many a physics undergraduate, including me, during his many years there – please leave a comment if you studied at Sheffield and remember him). This course introduced me to the fascinating world of the so called ‘higher transcendental functions’ of mathematical physics. I remember that we covered topics such as Bessel functions, Laguerre polynomials, Hermite Polynomials and the Gamma function among others but in a one semester course we only really scratched the surface of the subject. Since then I have come across several other special functions during the course of my work such as the LambertW function, Mathieu functions, Chebyshev polynomials and more. I used to be a physicist and so, despite the fact that the theory behind these functions can often be fascinating, all I had time to consider back then was how to evaluate them. In fact, as far as my professional life goes, the question of evaluation is still the only thing that I get asked about regarding special functions. 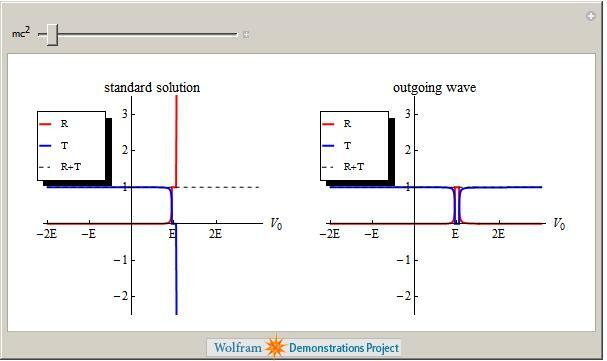 Questions such as ‘How can I evaluate the LambertW function in MATLAB?’ (Answer – by using this user-defined function) or ‘Do you know of a free, open source, implementation of Bessel’s function?’ (Answer – the GNU Scientific Library). The idea for this post came to me while reading an article written in 1994 (and subsequently updated in 2000) where the authors discussed the Numerical Evaluation of Special Functions. One of the features of this document was a list of various special functions combined with a list of software packages that could evaluate them. For example it lists Dawson’s integral and tells us that if you need to evaluate this then you can use various software packages such as the NAG libraries or Numerical Recipes. I thought that this was a very useful document but a major problem with it is that it is rather out of date! Wouldn’t it be great if someone were to create an updated version that included all of the latest advances in software libraries and applications. I even idly thought of attempting to do this myself and publish the results here but it turns out that I have (thankfully) been beaten to it. It’s not finished yet but the NIST Digital Library of Mathematical Functions looks like it is going to be exactly what I need. 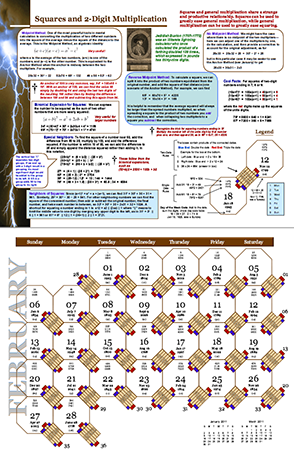 Apparently this project aims to be a sort of modern rewrite of Abramowitz and Stegun’s Handbook of Mathematical Functions, a book that almost every physicist I knew had a copy of. The preview looks very promising to say the least! For example, take the section on the Gamma Function. The library contains everything you might want to know about this function such as its definition, 2D and 3D plots of its graphs, its series expansion and, of course, a list of software packages and libraries that can be used to evaluate it. I note that, for the Gamma function, one can choose from MATLAB, Mathematica, MAPLE, NAG, Maxima, PARI-GP, the GSL, Numerical Recipes and several others – not exactly short of Gamma function implementations are we? 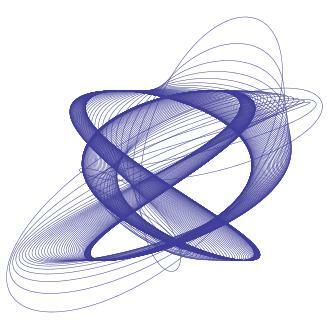 When it’s finished, the work will be published as a book called ‘Handbook of Mathematical Functions’ but will also be available freely online as a digital library – fabulous!